Noise can be defined as “disagreeable or undesired sound” or other disturbance…the differentiation is greatly subjective. What is sound to one person can very well be noise to somebody else. From the acoustics point of view, sound and noise constitute the same phenomenon…the result of pressure variations, or oscillations, in an elastic medium (e.g., air, water, solids), generated by a vibrating surface, or turbulent fluid flow. The free field is a region in space where sound may propagate free from any form of obstruction. The near field of a source is the region close to a source where the sound pressure and acoustic particle velocity are not in phase. In this region the sound field does not decrease by 6 dB each time the distance from the source is increased (as it does in the far field). The near field is limited to a distance from the source equal to about a wavelength of sound or equal to three times the largest dimension of the sound source (whichever is the larger). The far field of a source begins where the near field ends and extends to infinity. Note that the transition from near to far field is gradual in the transition region. In the far field, the direct field radiated by most machinery sources will decay at the rate of 6 dB each time the distance from the source is doubled. For line sources such as traffic noise, the decay rate varies between 3 and 4dB. The direct field of a sound source is defined as that part of the sound field which has not suffered any reflection from any room surfaces or obstacles. The reverberant field of a source is defined as that part of the sound field radiated by a source which has experienced at least one reflection from a boundary of the room or enclosure containing the source. Whenever sound waves encounter an obstacle, such as when a noise source is placed within boundaries, part of the acoustic energy is reflected, part is absorbed and part is transmitted. The relative amounts of acoustic energy reflected, absorbed and transmitted greatly depend on the nature of the obstacle. Different surfaces have different ways of reflecting, absorbing and transmitting an incident sound wave. A hard, compact, smooth surface will reflect much more, and absorb much less, acoustic energy than a porous, soft surface. If the boundary surfaces of a room consist of a material which reflects the incident sound, the sound produced by a source inside the room – the direct sound – rebounds from one boundary to another, giving origin to the reflected sound. The higher the proportion of the incident sound reflected, the higher the contribution of the reflected sound to the total sound in the closed space. This “built-up” noise will continue even after the noise source has been turned off. This phenomenon is called reverberation and the space where it happens is called a reverberant sound field, where the noise level is dependent not only on the acoustic power radiated, but also on the size of the room and the acoustic absorption properties of the boundaries. As the surfaces become less reflective, and more absorbing of noise, the reflected noise becomes less and the situation tends to a “free field” condition where the only significant sound is the direct sound. By covering the boundaries of a limited space with materials which have a very high absorption coefficient, it is possible to arrive at characteristics of sound propagation similar to free field conditions. Such a space is called an anechoic chamber, and such chambers are used for acoustical research and sound power measurements. In practice, there is always some absorption at each reflection and therefore most work spaces may be considered as semi-reverberant. The phenomenon of reverberation has little effect in the area very close to the source, where the direct sound dominates. However, far from the source, and unless the walls are very absorbing, the noise level will be greatly influenced by the reflected, or indirect, sound. For the study of occupational exposure to noise and for the establishment of noise criteria, not only the physical characteristics of noise should be considered, but also the way the human ear responds to it. The response of the human ear to sound or noise depends both on the sound frequency and the sound pressure level. Given sufficient sound pressure level, a healthy, young, normal human ear is able to detect sounds with frequencies from 20 Hz to 20,000 Hz. Sound characterised by frequencies between 1 and 20 Hz is called infrasound and is not considered damaging at levels below 120 dB. Sound characterised by frequencies in excess of 20,000 Hz is called ultrasound and is not considered damaging at levels below 105 dB. 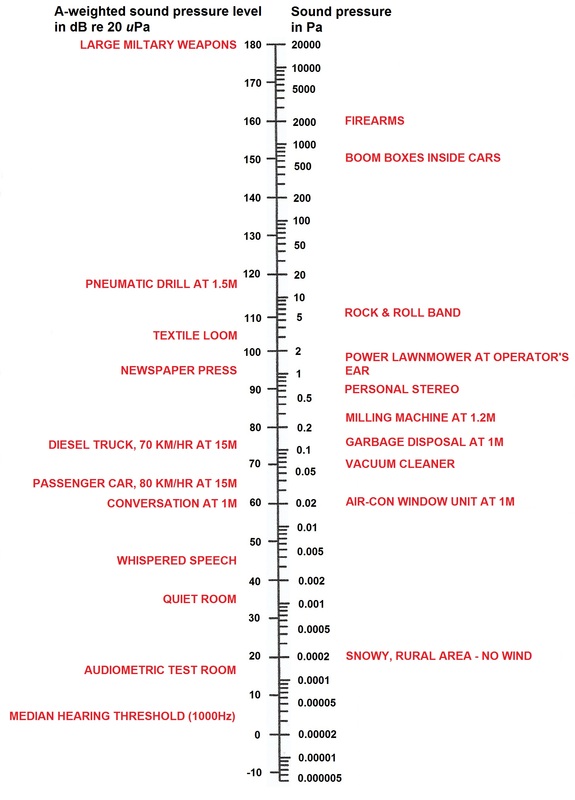 Sound which is most damaging to the range of hearing necessary to understand speech is between 500 Hz and 2000 Hz. At the threshold of hearing, a noise is just “loud” enough to be detected by the human ear. Above that threshold, the degree of loudness is a subjective interpretation of sound pressure level or intensity of the sound. The concept of loudness is very important for the evaluation of exposure to noise. The human ear has different sensitivities to different frequencies, being least sensitive to extremely high and extremely low frequencies. For example, a pure-tone of 1000 Hz with intensity level of 40 dB would impress the human ear as being louder than a pure-tone of 80 Hz with 50 dB, and a 1000 Hz tone at 70 dB would give the same subjective impression of loudness as a 50 Hz tone at 85 dB. In the mid-frequency range at sound pressures greater than about 2 × 10-3 Pa (40 dB re 20 μPaSPL), the table below summarises the subjective perception of noise level changes and shows that a reduction in sound energy (pressure squared) of 50% results in a reduction of 3 dB and is just perceptible to the normal ear. 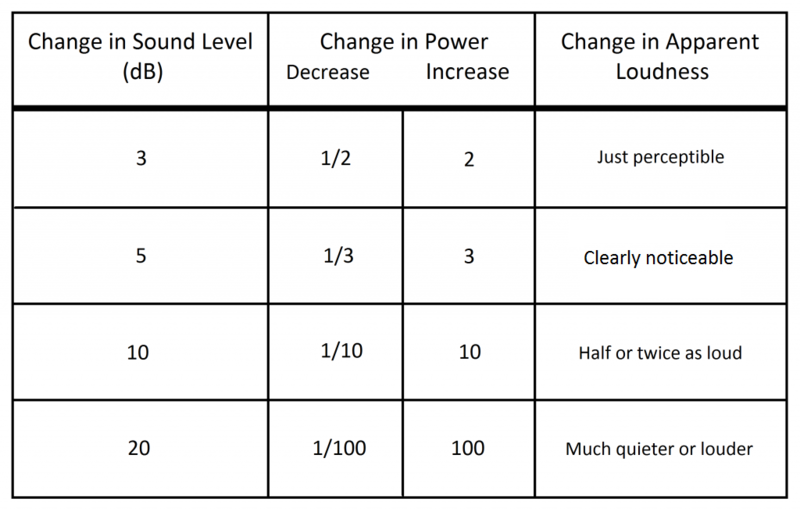 Subjective effect of changes in sound pressure level. This entry was posted on Sunday, July 3rd, 2016 at 6:39 pm	and is filed under Soundproofing News. You can follow any responses to this entry through the RSS 2.0 feed. Both comments and pings are currently closed.